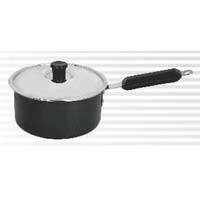 Hard Anodized Saucepan that we offer is manufactured keeping in mind the safety of users. It is ergonomically designed for better grip, comfort and convenience. Moreover, our Saucepan is easy to handle. 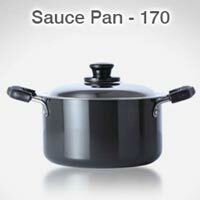 We are one of the prominent Manufacturers, Exporters and Suppliers of Saucepan. Buy Hard Anodized Saucepan from us at market-leading price! One can place retail as well as bulk orders for the saucepan with us. 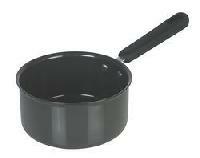 Avail from us an array of Hard Anodized Saucepan which is available in taper and flat form. Made from high gauge metal, our range of anodized sauce pan is easy to clean and maintain. Our range is available in different size and can be customized as per the specification of client. We are among the leading manufactures, importers, exporters and suppliers of hard anodised cookware or Hard Anodised Saucepan . We offer a wide variety of hard anodised cookware. They are manufactured using high grade material. It incorporates heavy duty handles which makes it easy to handle. The hard anodised cookware offered by us is of unmatched quality.